Train employees, customers, and partners with an evolutionary LMS that bends to fit your training needs. They might not fit every organisation's needs, but they are certainly a cost-effective and easy-to-use way to implement the structure of your organisation to suit your learning needs. It allows us to train our many different customers how to use our products, while also allowing them to use eFront to add their own content. 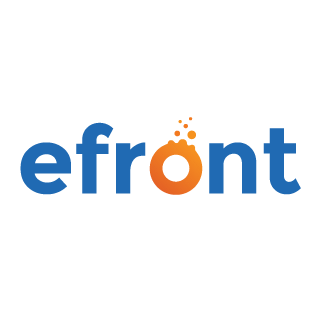 The think that I like the most about the eFront tool is that it is intuitive and easy to use. With just a little bit of effort the admin can be up and running very quickly. The only limitation that I see at this point is the lack of an easy way to associate users with their manager or director within our hierarchy. eFront tool is a tremendous tool for any organization that needs to develop and deploy training content to a large organization. eFront allows us to quickly and easily distribute new training content to our new hires during our onboarding process. It also allows us to manage our annual compliance training with ease. I like how the design interface of eFrontLearning and how easy it is to teach customers and users on how to navigate through it. It was also a huge improvement from their previous version when it comes to managing courses from the admin level. eFrontLearning is a nice LMS for small or huge organizations without being hindered by the high costs required by other big LMS services. We want to have an LMS that not only can host our courses but also offer those courses to our clients. Being able to have a group for each of our client and assign admins and report managers for each group helps us keep things compartmentalized. Hi, thanks for taking time to review eFrontPro. We truly value your feedback, and we'd like to take the opportunity to let you know that customized email blasts, announcements and notifications are already in progress, while the granular upload is added in our roadmap. Now, as for the admin part, we are not sure what's the issue you've faced, but our support team is always happy to help you, should you need assistance. I use efront to perform examinations at the non-profit I am working for. After two years of using it I can honestly say that is one of the best choices. It is very simple to use, without the need for technical knowledge and it has many different options for exam questions covering all I need. Hi, thanks for your review! We strive to make eFrontPro easy to use, so that you don't need advanced technical skills to use it properly. In any case, our support team is always happy to help with anything you might assistance with! The user friendliness of efront and ease to use is what I like best. It is cost effective as well. Customisation is a bit limited. Limited plugins to add functionalities. Being an online training provider efront has made it possible for us to deploy and run courses with minimal effort. "I had a great experience with your product!" I enjoyed how user friendly the platform is. I dislike the cap on our number of users. It would be great for us to open it to a larger audience. We are creating an ethical platform for service. We can distribute useful information to a wider audience. We use it for surgery courses, a lot of videos, presentations, it is easy to manage the information and check the progress of students. The online support is also awesome! I need a programmer to help me upload the content. The platform let us keep progress of the students, we use a lot of videos and that is not a problem at all. Hello, thanks very much for your review! We've designed eFrontPro so that it is easy to use, so that you don't need any advanced coding skills to upload your content. Should you need assistance, our support team will be happy to help you so that your experience with our platform is smooth and efficient! We were getting a new LMS in place and had a list of about 100 requirements. Efront Pro was able to meet about 65 of those and in the end was not the best fit for us. The platform is user friendly, has lots of functionalities and capabilities. It is great to use. No possibility to have video conferences within the platform. Hi, thanks a lot for your valuable feedback! As we strive to offer integrated eLearning solutions, we've made sure that eFrontPro supports video conferencing - currently through our integrations with BigBlueButton and Webex, and in the near future through Gotomeeting and more. In any case, don't hesitate to contact our support team, we'll be very happy to help! * We monitor all eFront reviews to prevent fraudulent reviews and keep review quality high. We do not post reviews by company employees or direct competitors. Validated reviews require the user to submit a screenshot of the product containing their user ID, in order to verify a user is an actual user of the product. Hi there! Are you looking to implement a solution like eFront?